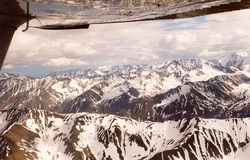 These beautiful mountains stretch from Arizona north through Canada to Alaska. They are so tall that they kept people from getting to California easily. 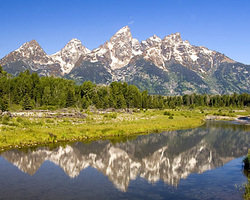 Yellowstone is a National Park in parts of Wyoming, Idaho and Montana. It is an area with a lot of volcanic activity. 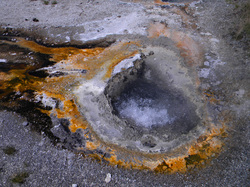 There are active geysers in the park that heat up and spew water in the air. Many species of animals live in the park. It is a wonderful part of the wild west. 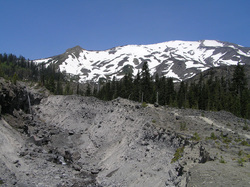 This mountain in Washington State was an active volcano. It erupted in 1980 and was mostly an explosion of ash and rock. Several people were killed and were never found in the avalanche of ash and rock. Ash drifted in the atmosphere and landed on homes and cars as far away as Indiana. Alaska is a cold and frozen state of the West. It has a very different climate and economy from Southern California, for example. People in Alaska work in fishing and related industries. They also work in the oil fields. 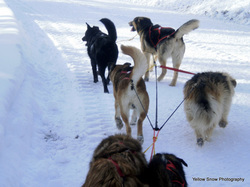 Alaska is rich in natural resources. This is the desert region of Nevada and parts of Utah. It is dry and was once an inland sea long ago. The Great Salt Lake is the last of that inland sea. The water has a high level of salt. The Central Valley of California is where many important crops are grown. This is a photo of almond trees in bloom. Many fruits such as plums, mandarins, apples and peaches are grown here. Walnuts, pecans and almonds are also grown here. It can be very hot in the summer and very cool and foggy in the winter. Mt. McKinley is in Alaska. It is also called Denali. It is the tallest mountain in North America. The highest peak reaches 20,320 feet. The top of the mountain is covered in snow year round. 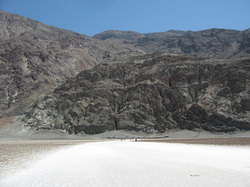 Death Valley, in California, is part of the Great Basin. It is a very hot and dry desert covering parts Oregon, Utah, Southern California, and Idaho. Hawaii is one of the United States. It is west of California in the Pacific Ocean. Hawaii was formed by underwater volcanoes. 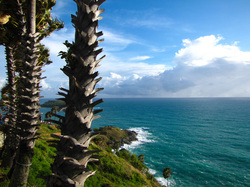 Today, there are lush, tropical rain forests on all of the Hawaiian Islands. There are still some active volcanoes on Hawaii. 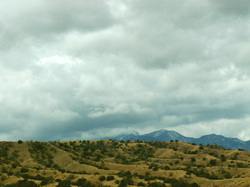 Mountains in many parts of the West create areas of rain shadow. The clouds build up on the side of the mountains closest to the oceans. The clouds cannot move over the mountains so they stay stuck on one side and rain and rain. Once they are lighter, they can move over the mountain. The rainy side is called the rain shadow. Fruits and Vegetables are grown in many parts of the West. 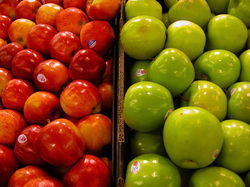 The Willamette Valley in Oregon grows many apples and pears. 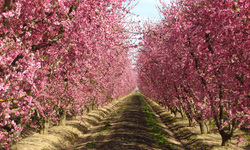 The Central Valley in California grows many fruits, nuts and vegetables. Many ranches are in the West. People raise cattle for meat. 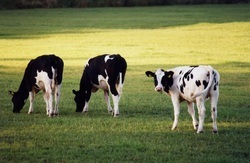 There are also large dairy farms in the West to supply milk for making cheese, ice cream and other dairy products. 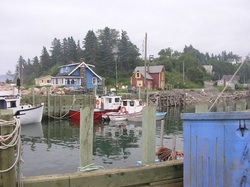 Fishing is a big industry in the West. Many places such as Seattle depend on fishing for a large part of their economy. People all over America eat fish that comes from the West. Trees are an important resource. Trees are used for lumber and are carefully replanted to make sure there will always be forests in the West. Some forests are protected and lumber cannot be taken from them. 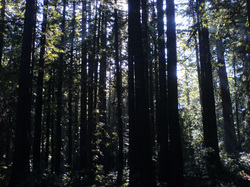 Forests are an important tourist destination in the West. Many people camp and hike in state and national forests.